Kirkwall Auction Mart was founded in 1901 by Gordon C Webster when he began weekly Monday sales. It wasn't until 1903 that he built 'the Mart' which was made of wood with a small ring. It was then bought by Mr John T Flett in 1918 where Gordon Webster continued to work as the Auctioneer. In 1924 Mr T Smith Peace took over the mart and later bought it in 1928. The Mart was extended considerably in 1937. On July 2nd 1953, Kirkwall Mart was bought by the Farmers for £21,000 becoming a farmers co-operative. The Management Committee appointed two joint managers to run the Mart. They were Mr V J Linklater, who had been Auctioneer for some years, and Mr W McBey. Mr Linklater was Auctioneer, Mr McBey was Secretary and Mr Hugh Inkster was made Cashier. On July 1st 1993, Kirkwall Mart and the West Mainland Mart amalgamated to form Orkney Auction Mart. John Copland was Manager with Jim Linklater as Auctioneer. 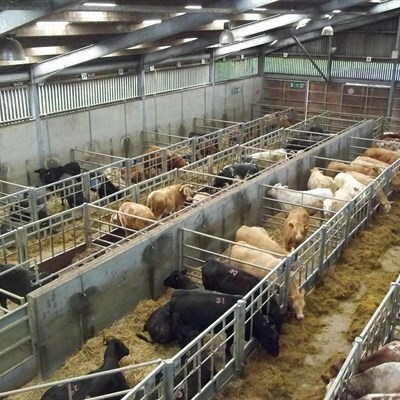 Orkney Auction Mart has continued to thrive ever since and has seen some changes with John Copland, Rob Crichton and Jim Linklater being Managers. As of March 2015, Malcolm Scott was appointed Manager.